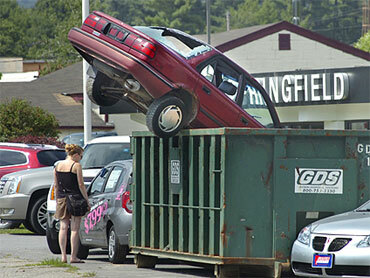 Congress Races to Save "Cash for Clunkers"
Last Updated at 12:41 p.m. EDT. The House raced Friday to pass legislation pouring an additional $2 billion into the popular - but financially strapped - "cash for clunkers" car purchase program. Debate commenced at midday, and House Majority Leader Steny Hoyer predicted a vote within hours, saying the funds would come from money approved earlier in the year as part of an economic stimulus bill. The Maryland Democrat said that at the request of House Republicans - whose approval was required for swift passage - the bill would include provisions for government auditors to make sure the money was being spent as intended. Senate action is likely next week, making sure the program would not be affected by the sudden shortage of cash. Rep. David Obey, D-Wis., said "consumers have spoken with their wallets and they've said they like this program." Republicans argued that Democrats were trying to jam the legislation through hurriedly. The Senate was not scheduled to vote on Friday but lawmakers hoped to win approval for additional funding next week. House members acted within hours of learning from Transportation Secretary Ray LaHood that the program - designed to help the economy as well as the environment - was out of funds. Under the program, car owners can receive federal subsidies of as much as $4,500 if they trade in their old car for a new one that achieves significantly higher gas mileage. Sen. Carl Levin, D-Mich., said the administration assured lawmakers that "deals will be honored until otherwise noted by the White House." But he suggested that "people ought to get in and buy their cars." White House spokesman Robert Gibbs said Friday that the program is still "up and running," reports CBS News White House correspondent Mark Knoller. "If you were planning on going to buy a car this weekend, using this program, this program continues to run," Gibbs told reporters. He would not commit to any timeframe beyond that. But Gibbs said administration officials and bipartisan leaders of Congress were working Friday morning "to find and develop ways to continue to fund this program." A House Democratic aide had said earlier that Hoyer told lawmakers the legislation would transfer $2 billion from unused recovery funds because the vehicle program was an urgent priority. The aide spoke on condition of anonymity because he was not authorized to speak publicly about the program. House Minority Leader John Boehner of Ohio said lawmakers were working to bring the measure to the House floor on Friday but it was unclear how many Republicans would support on the plan. "There are a lot of questions about how the administration administered this program. If they can't handle something as simple as this, how would we handle health care?" Boehner told The Associated Press. The administration assessed its options amid concerns the $1 billion budget for rebates for new car sales may have been depleted. The program officially began last week and has been heavily publicized by automakers and dealers. Called the Car Allowance Rebate System, or CARS, the program offers owners of old cars and trucks $3,500 or $4,500 toward a new, more fuel-efficient vehicle, in exchange for scrapping their old vehicle. Congress last month approved the plan to boost auto sales and remove some inefficient cars and trucks from the roads. The program was scheduled to last through Nov. 1 or until the money ran out, but few predicted the fund would run out so quickly. The $1 billion in funding would provide up to 250,000 new car sales. It was unclear how many cars had been sold under the program. Sen. Debbie Stabenow, D-Mich., said about 40,000 vehicle sales had been completed through the program but dealers estimated they were trying to complete transactions on another 200,000 vehicles, putting the amount of remaining funding in doubt. John McEleney, chairman of the National Automobile Dealers Association, said many dealers have been confused about whether the program will be extended and for how long. Many had stopped offering the deals Thursday after word came out that the funds available for the refunds had been exhausted. "We are hoping for some clarity from the White House and Congress before the day is over," McEleney said Friday. The clunkers program was set up to boost U.S. auto sales and help struggling automakers through the worst sales slump in more than a quarter-century. Sales for the first half of the year were down 35 percent from the same period in 2008, and analysts are predicting only a modest recovery during the second half of the year. So far this year, sales are running under an annual rate of 10 million light vehicles, but as recently as 2007, automakers sold more than 16 million cars and light trucks in the United States. Earl Stewart, who owns a Toyota dealership in North Palm Beach, Fla., said the changing messages on the program has created confusion among his customers and his staff. Stewart's accounting department also could only enter about a dozen of the 47 sales he made into the government Web site set up to handle the transactions, leaving him wondering if he will get refunded for the remaining vouchers. With so much uncertainty surrounding the program, Stewart said he planned to continue to sell cars under the program Friday but would delay delivering the new vehicles and scrapping the trade-ins. Drivers would be put in loaners until he was absolutely certain the program was still going. "It's been a total panic with my customers and my sales staff. We are running in one direction and then we are running in another direction," he said.